These lovely interchangeable tips are made from color-coded wood in a striking new striped pattern they also have added shiny brass tips to the ends of each needles and lazer-printed sizes on each metal connector. The unique combination of wood and metal not only gives a refined look to the needles, but also provides an incomparable knitting experience. The special tips are 3.5 inches in length, perfect for 16 and 20 inch cords! 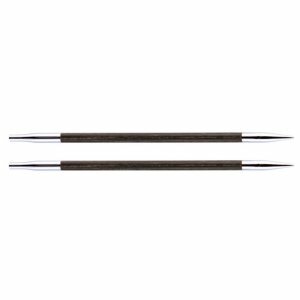 Knitter's Pride Nova Cubics Platina Special Interchangeable Needle Tips Needles and Knitter's Pride Cubics Special Interchangeable Needle Tips (for 16" cables) Needles are both similar needles: 3" / 3.5", interchangeable tips, and US 7 (4.5mm) US size. Knitter's Pride Nova Cubics Platina Special Interchangeable Needle Tips Needles From $6.65 to $9.50Select options on sale now!